Known as the “Cultural Capital” of Sri Lanka and a UNESCO world heritage site, Kandy was established in the years 135AD by King Wickramabahu and was named Senkadagalapura at the time. In 1592 Kandy became the official Capital of the last Sinhalese Kingdom as the coastal areas were conquered by the Portuguese invaders. 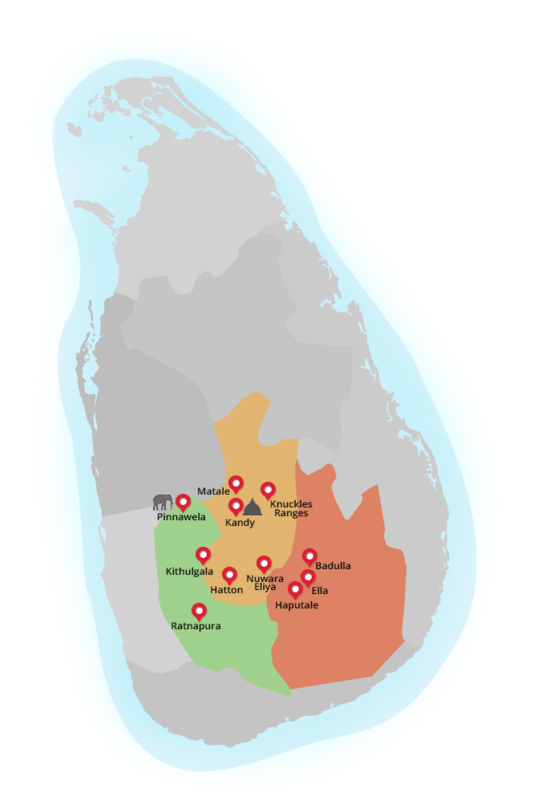 The hill capital remained a stronghold despite constant invasions by the Portuguese and the Dutch during the 16th, 17th and 18thcentury and also by the British (most notably in 1803) which were repelled thanks to the hilly landscapes, and guerilla tactics of the Sinhalese forces. The last ruling dynasty of Kandy was the ‘Nayaks’ of Kandy while the Kingdom preserved its independence until it finally fell to the British in 1815, mainly due to the lack of support of the noble families. The British deposed the last king, Sri Wickrama Rajasingha, and all claimants to the throne, thus ending the last traditional monarchy of Sri Lanka. Magul Bera: The blowing of the Conch Shell is the traditional invocation at the commencement of any function and the drums are an integral part of this ritual. An ancient Sinhala custom which presents ritual music when seeking the blessings of the Guardian Deities of the Land. Puja Natuma: The female dancers carrying oil lamps are making an offering (Pooja) of their dancing skills to the Guardian Deities. Mayura Natuma (Peacock Dance): A dance performed by females this depicts the graceful movements of the peacock which according to mythology is the bird which transports the God Skanda, the War God of Sri Lanka, and worshiped by Buddhist and Hindu alike. Panteru Natuma: The name of the dance is derived from the instrument used, the Panteru which is an instrument closer in resemblance to the tambourine. The rhythm is provided by the supporting drums, and the dance itself showcases Sinhalese Warriors on their way to battle. The instrument is manipulated with great skill and dexterity which creates a series of acrobatic moves. Kulu Netuma: This is the traditional harvest dance which is performed by village girls to celebrate the rich harvest. The dance portrays the sequences of reaping to winnowing of the grain. This is a buoyant dance which provides ample opportunities for displaying grace and agility and is danced to the accompaniment of light drum beats as well as the haunting strains of the flute. Ves Natuma: This is the highest level of Kandyan Dance forms and performed only by the highest ranking dances. The costume can be earned by only the most senior and skilled dancers and consists of sixty four ornaments. Years of hard training is required to achieve the honor of donning this costume and is the highest honor a dancer can achieve. The Kandyan Arts Association and Cultural Centre is one of the best places in the country to view some of the traditional handicrafts and art such as the local lacquer work, brassware, antique furniture and other crafts items. Antique furniture, earthenware, jewelry and batiks designs can also be purchased around Kandy and its suburbs. The Kandy City Centre is the largest retail shopping complex in the area and is a modern day landmark in the city. The Royal Botanical Gardens is the largest of Sri Lanka’s botanical gardens with over 4,000 different species of plants and is regarded among the finest in Asia. The origins of the Botanical Gardens date to 1371 when King Wikramabahu III took to the throne and kept his court at Peradeniya near the Mahaweli, where the gardens were reserved exclusively for Kandyan Royalty. Some of the highlights when visiting these unique gardens would be the Orchid collection, walking through a stunning avenue of Royal Palm Trees as well as a giant Javan Fig Tree on the great lawn. Another key feature of the gardens is the large collection of medicinal plants and spices. A wild retreat from the busy town of Kandy, the beautiful forest of Udawattekale is located behind the Temple of the Tooth has a long history which dates back to many centuries. This was a forbidden forest by the kings of old, and protected by law. The forest consists of giant trees, creepers, lichens, mosses, ferns and a variety of birds and other wildlife maybe seen during a guided nature walk through the walking trails within this forest. The Sri Lanka Hanging Parrot, Layard’s Parakeet, Sri Lanka Green Pigeon, Brown-capped Babbler, Yellow-fronted Barbet, Crimson-fronted Barbet, Sri Lanka Jungle-fowl and the Sri Lanka Grey Hornbill are among the endemic birds which may be seen during a walk through the forest. Other fauna encountered routinely include Troops of Toque Macaques, Palm Squirrels, Giant Wood Spiders and endemic Kangaroo Lizards. Located behind the Kandy National Museum, contains 163 graves which date back to the British Colonial Period. One of the most noticeable features of the graves is the young age of those who have died. The building was once used to house the Royal Concubines, and now contains reminders of the pre-European Sinhalese life. One of the key items on display is the copy of the documents which were signed handing over the country to the British in 1815. The building also contains many interesting displays and artifacts from days gone by. Another feature of the museum is the stuffed display of the legendary temple tusker Raja. He was one of the most celebrated elephants in Asia during his lifetime. A few Kilometers from the Kandy town is Bahirawa Kande or Gnome Mountain. Many legends are surrounded around this sacred rock, and were once believed to have a sacred deity. Now a temple is built on top of the mountain with a giant Buddha Statue which dominates the landscape. This is a sacred monastic complex with many ancient relics and monuments. It is a principle temple of significant importance with the high priest regarded as head of order of Buddhist monks for the country and the head priests also administer the Temple of the Sacred Tooth Relic. The museum located in the Hantane Tea Factory is 5km from Kandy. The factory displays machinery and equipment used in the times of the colonial period, and demonstrates the process of manufacture. The museum also contains many artifacts of the pioneering days of Ceylon Tea, and images and books on this period. This temple complex was built atop a rock in 1344 during the reign of King Bhuvenakabahu IV, who ruled over the Kandyan kingdom. There is a cross-shaped shrine as you enter the temple complex, where each wing has attractive wall paintings and houses a Buddha image and is crowned with a small dagaba . The main stone temple has two small elephant sculptures leading into the entrance. The walls on the exterior contain carvings of dancers and drummers, which resemble the south Indian style of architecture. In the interior of the temple is a seated statue of a golden Buddha decorated with murals.